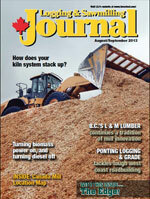 Logging & Sawmilling Journal August/September 2013 - How does your kiln system stack up? S & R (Photo of S & R Sawmills millyard by Paul MacDonald). Home-grown wood pellets for NWT? The Northwest Territories sees a business opportunity for home-grown wood pellet production with the growing use of wood pellet heating, supported by a strategy to reduce greenhouse gases. A mill upgrade at B.C.’s L & M Lumber—involving a new optimized log breakdown and processing line—positions the independent producer well for recovering lumber markets, and continues a tradition of innovation and improvement. Mark Ponting and his construction crews tackle building logging road in some of the toughest ground in the country, on the B.C. Coast, and they rely on their equipment dealers to help out in minimizing equipment downtime when they are “miles from nowhere”. Saskatchewan’s Mistik Management is adapting to the growing timber needs of the NorSask Forest Products mill, which is adding a shift, and is going to require twice as much wood—but it’s a challenge they’re very happy to have. How does your kiln system stack up? With mill management always on the lookout to improve their drying operations, it was no surprise that a recent kiln drying seminar in Quebec City drew good attendance, and lively conversations. The market for Oriented Strand Board has improved with the recovery of the U.S. housing market, and Ainsworth Lumber—which is in the process of being purchased by forestry giant Louisiana-Pacific Corp.— is looking at ramping up its OSB operations to meet the increased demand. The Miramichi Lumber sawmill in New Brunswick has recently completed an upgrade, including an entirely new small log saw line, and is now raring to go to meet recovering lumber markets. A wood biomass-fired power system in the works in the small village of Kwadacha, B.C. could be a model for other remote communities looking to wean off costly diesel and propane for power production. Logger Clint Lightburn is rolling with the changes as forest company Canfor is asking its contractors in southeastern B.C. to move from delivering tree length wood to cut-to-length to its upgraded mill facility at Elko. LSJ looks at the technology and systems available to help mill management better manage and operate mills. Jim Stirling takes a look at the debate surrounding the creation of more area based forest licences in British Columbia. The Miramichi Lumber sawmill in New Brunswick has had an upgrade—which includes an entirely new small log sawline—and is now raring to go to meet recovering lumber markets. But securing a steady supply of quality timber from Crown land remains a challenge. In late-April, New Brunswick’s Miramichi Lumber fired up their newly renovated random length sawmill with a heap of optimism from managers, recalled employees and the greater Miramichi community. Miramichi Lumber General Manager Danny Anderson was looking forward to sawing the supply of logs in their millyard, and switching to fresh logs as Crown land operations got underway following spring road closure. By July, though, the sense of optimism had waned as the quality of saw logs from Crown License 3 deteriorated to something comparable to stud wood saw stock, according to the company’s chief financial officer, Hal Raper. License 3 covers a significant area of the Miramichi River watershed. “We have made numerous representations to DNR including the minister, with no positive response,” commented Raper. In July, Miramichi Lumber announced to its employees that the mill could not sustain operations with an unsuitable and inconsistent saw log supply, and would have to temporarily cease operations. In September, however, it resumed operations, and 60 people were back at work. Increasingly, there are calls from a variety of sources across New Brunswick for a comprehensive review of the Crown lands management system and to consider a serious look at restructuring the Crown timber management system as British Columbia, Ontario and Quebec have in recent years. Lumber has long been central to the history and economics of the Miramichi River region. The Miramichi watershed drains nearly half of the provincial land base and through the centuries has provided logs to drive a lumber industry that supplied shipbuilding, the export lumber trade and a wide variety of wood fibre-using industries. Four generations of the Anderson family have operated sawmills on the Miramichi River. Currently, Danny Anderson manages the last remaining sawmill on the Miramichi, a mill that boasts a history that dates back to the beginning of European development in eastern Canada. Early European explorers recognized the value and opportunity that virgin white pine forest offered, and began square timber trade to England. As business grew around square timber, entrepreneurs swiftly geared up to mill lumber for export. Many of those early entrepreneurs took the next logical step and used some of their lumber to construct ships and fill them with lumber—and then with a group of Miramichi lads, crewed their ships to deliver loads and sometimes the ships, to brokers in England and Europe. Miramichi lumber was key in New Brunswick being recognized for its massive wooden ship fleet that delivered cargoes around the world. The Miramichi River system reaches deep into a very productive forest, and spring thaws allowed for log drives that supplied, literally, hundreds of mills located along the river. The Miramichi forest and water resource helped build a massive lumber producing machine consisting of hundreds of sawmills. Water powered mills in time were converted to steam and later still, to electricity as efficiencies were achieved. River drives faded by the middle of the past century as road transport improved. While softwood lumber continued to be a key economic driver for the Miramichi, specialty mills producing veneers, shingles, lathe and other wood products sprung up to utilize logs coming from the region. In the early 1900s, pulp mills were established on the Miramichi, utilizing the forest resource and shipping finished product through the port to customers around the world. Regrettably, the massive pulp and paper mills disappeared from the Miramichi before the end of the century. But after years of exploitation, the Miramichi watershed continues to produce high quality logs and fibre, but rather than supplying industry in the region, more and more of the wood is transported to mills outside the region. Danny Anderson is general manager of the Miramichi Lumber random length sawmill, an operation which snuggles up beside the central business district of the city of Miramichi. The Anderson family began sawing lumber at Burnt Church at the mouth of the Miramichi in 1880. Danny’s grandfather, Walter, took over the family operation and moved the mill to the waterfront of the town of Newcastle (which later amalgamated into the city of Miramichi) in 1922. Danny’s father, Ian, rebuilt the mill operation, known as Newcastle Lumber, at the current Jane Street location, in 1968. Danny continued the family’s sawmilling tradition; as a youth he worked in family milling and logging operations, and then graduated from Maritime Forest Ranger School in 1981. Danny’s career managing sawmills began with the Dead River Timber Company, managing the Boyce Corey mill on the Canaan River in southern N.B. Danny took over management of the Newcastle Lumber mill in 1987. Taking advantage of the mill’s location immediately next door to port facilities, the Anderson family maintained profitable trade relations with lumber brokers in Europe through the 1980s, when their marketing switched to domestic and regional markets in Canada and the U.S. In recent years, about 25 per cent of the mill’s production is sold to U.S. customers, with another 25 per cent going to Ontario and Quebec and the remaining 50 per cent of production delivered to Atlantic Canada customers, using Eacan Timber as their exclusive broker. “As an industrial operation, we continue to have great support from our urban neighbours and businesses. Our mill is a major employer and we rely on many service industries in the city and region for our operation,” said Anderson. Newcastle Lumber had relied on conventional rotary saws and carriage technology to produce rough lumber for many years. As demand for rough lumber waned, Newcastle contracted out drying and dressing up until 2002, when they purchased the Ashley Colter mill at Boiestown (100 kilometres up river), specifically to utilize their electric dehumidification kilns and planer mill. In 2011, they also purchased the former UPM sawmill site (mill equipment removed) to utilize the kilns and planing equipment that have the potential to produce one million board feet per week, and is only 45 kilometres up river from the mill. The business models which had worked for four generations of Andersons regrettably failed, with the industry wide economic downturn wiping out several sawmills across N.B. While many independent mills across the province closed down, a survivor spirit of survival emerged from the greater Miramichi community. Business and political leaders recognized the economic value of the mill operation and rallied to support rebirth of the Newcastle Lumber operation. Some twenty-five private investors eventually came together to pull the former Newcastle Lumber assets out of bankruptcy, and add technological upgrades to make the operation more productive and competitive. Fresh investment built an entirely new small log sawline in the mill. The restructured business was christened as Miramichi Lumber, with Danny Anderson as general manager and Hal Raper in the position of chief financial officer. The government of New Brunswick also provided significant financial support for the restructured operation and added a promise for an increased allocation of sawlogs from Crown forest resource. While the original saw line with its 26” Cambio debarker with 48” Oxford rotary saw and 36” top saw and Morbark carriage continues to cut cants feeding to a PHL 10” gang saw for large diameter logs, an entirely new saw line for smaller logs was added to the mill. The new saw line brought significant modernization, with the addition of a new curve saw line complete with 3D scanning technology, log positioning and curve sawing. The new line leads off with a 22” Nicholson debarker, a new 3D log scanner and log turner, a 72” Comact twin band head saw, a 3D cant scanner, and curve sawing 8” canter bull. The mill upgrades included improvements to the Comact trim saws. The new technology allows for greater lumber recovery from each log and much faster production. New equipment and upgrades to the mill allow Miramichi to saw 200,000 board feet per day. Miramichi Lumber relies on a 66” Morbark chipper and a 58” Forano chipper, with pulp chips selling to either Irving’s Saint John N.B. mill or Northern Pulp in New Glasgow, Nova Scotia. The Miramichi Lumber log yard has the capacity to pile down 40,000 cubic metres. Its wheel loader complement includes a 966 Cat, a 380 Komatsu, 320 Komatsu and a L90C Volvo. 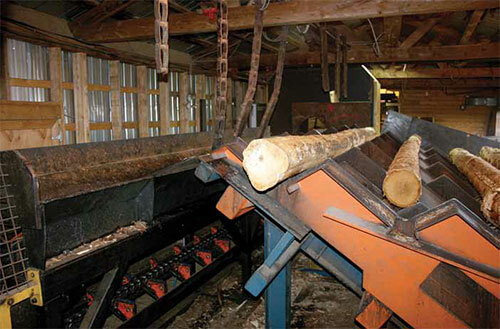 Traditionally the mill relied on private woodlot producers for nearly half of their saw log supply, with the balance from Crown allocations and purchases from industrial suppliers. The closure of the Miramichi’s UPM pulp mills in 2007—in addition to other pulp mill closures in the province—combined with an oversupply of pulp mill-destined fibre from Crown land for the remaining mills has meant the private woodlot sector has struggled to regain market access at a competitive rate in order to make harvesting viable. Since the economics of harvesting requires a fair price for pulp logs as well as stud and long logs, log production from private woodlots has been dramatically reduced. The re-start of the Arbec OSB mill in Miramichi and their incorporation of low grade softwood fibre in their process has been welcomed by private producers in the province. But their demand is limited and the private woodlot sector continues to struggle to get production back to something like normal levels. The company was making efforts this past summer to engage the provincial government, and address the timber needs of the mill from Crown land—and gets its people back to work.